Thanks to the innovative and advanced three-stage filter, the Esperanza air purifier stops up to 99.7% of air pollutants including: allergens, pollen, dust, suspended particulates. It can absorb formaldehyde, benzenes, xylene, TVOC, other harmful gasses and unpleasant odors. The built-in UV lamp eliminates bacteria, mites, viruses and fungi. The negative ions have an extraordinary ability to combine with positively charged floating dust, smoke. Thanks to that they kill bacteria and viruses. 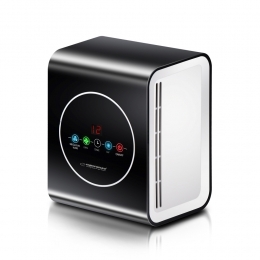 Esperanza air purifier is a modern device which will make perfectly clean and fresh air in your home.